I like to have time for ideas to incubate because once I start thinking about a topic, almost always something else appears that relates to it. I have written about Hello Kitty and now I see those products everywhere including in the shampoo aisle, fruit snacks and toothpaste. I presented a speech using Oreos as a metaphor, and with regularity I still see products that use Oreos and new specialty flavors of the cookie. I searched to give my lime-loving brother-in-law a birthday package of lime flavored products and now they show up almost daily. I had this experience during one of my FitBit quests*. It’s hard to walk the aisles of a grocery store without shopping, so instead of hunting for items on my list, I decided that I would try to find blog ideas. It is amazing what you can see when you start to focus and look at things with an intentional perspective. There is so much information and stimulation out there that we need to narrow our filters so we actually can process some of it. By focusing in on potential blog ideas, the store came alive with possibilities: specialty cheese, Kuerig, colored M&Ms, bacon in a box, allocation of space, cake mixes. If I had not focused on finding topics, I would have missed them all. Allow yourself some time for your mental radar to scan the environment and find the answers for you. Usually they are out there if you first frame the question and then just pay attention. You may have noticed a grocery store theme over the last week — something that would be surprising to those who know me and know how little I frequent the place. But I have been wearing a FitBit activity tracker and am committed to walking 10,000 steps each day — and some days that means roaming the aisles of the grocery store to log those final paces. Wearing a FitBit puts an extra kind of pressure or accountability on the wearer; it something that you need to attend to every day. I walk the aisles and achieve the goal, but the next morning I am back to zero. There is no working ahead or stockpiling steps; it’s 10,000 per day, not 70,000 per week. In reality, FitBit becomes a discipline tracker. It tests my mettle to see if I can find the dedication to get those darn steps in regardless of my schedule, the weather or social plans. I find myself walking to offices more frequently vs. emailing. Cruising the sidewalk outside a restaurant while waiting for my friend to arrive. Doing my physical therapy stretches while moving about the house instead of standing still. And, of course, my dogs think that the FitBit is outstanding! What can become a motivator and discipline incentive for you? Maybe it relates to something besides exercise: you want to meditate every day or reflect in a journal. Or maybe you commit to writing something: a blog, part of your dissertation, a novel. Or perhaps you want to read an article, paint or knit. What will promise will you make to yourself? These staples persist on the shelves, despite no promotion or advertising, yet garner enough sales to preserve their spot in a crowded marketplace. What makes them endure when thousands of other products have failed? I suspect that they remain because they offer consistent quality and fulfill a need that has not been replicated by any of the modern products. Jiffy Pop is still great over campfires. Fels Naptha really does remove stains. TaB boasts its diet taste, not an imitation of regular soda. The lesson is that you don’t have to be flashy or spend a fortune to endure. Some things can flourish under the radar from the masses if they are the right product. How can you help your organization focus on quality instead of trying to promote an average offering? Thanks to Tracy for the idea. This is the time of year in the academic world where resignations abound. Those that do remain are more crabby and irritated — “squirrely” as I call them — as the workload increases and the remaining days on the semester’s calendar tick away. Understanding the distinction is important in assessing next steps. If it’s a matter of overload, that problem could be addressed with time management, delegation, reallocation or other fixes — or even the arrival of the summer term. But a crisis of spirit is a much different issue. That requires soul searching and reflection to determine the best course of action. If you are feeling unsettled in your current organization or work role, think about the source of your restlessness before you reroute your journey. Today I will be attending the wedding of one of my former students. It’s as close to being the mother of the bride as it will come. Natalie and a friend were both from out of state and “stuck” on campus with nothing to do over Labor Day early in their college careers. I bonded with them when I took them to the zoo over the weekend. I also I earned “50,000 cool points” from them for jumping into a pool with a (black, washable) dress on. In the seven years since we have been apart, each weekend we have written notes to each other, in old-fashioned longhand via snail mail! A friendship this does make. It has served me well to have an inter-generational perspective on what is happening in the world. Through her eyes, I have seen the struggle of a new graduate looking for work, starting out on her own, paying back loans, and now beginning this new chapter in life. It has assisted me as I craft messages and materials to reach out to students and prospective students on our campus. Think of the relationships you maintain. Are they all with people your own age? If so, you may be missing a viewpoint that could assist in your understanding and empathy. Try to cultivate a conversation, if not a friendship, from someone who is at a different stage of their life and see what you can learn — and cherish. It’s not just instant bacon and microwaves that are giving us fewer opportunities to practice patience. Our immediate access to entertainment, information, resources and each other has fueled our demand for immediate gratification with everything. Patience is a character trait that is on the decline according to the Pew Research Center. And the downside of this means that people exhibit less self-control, are less able to work collaboratively and relationships suffer. Studies have shown that those who were able to delay their rewards had lower stress, higher achievement and were overall more likable. Who doesn’t want that!? I could add: make the bacon from a package and fry it in a pan! Think about that and other strategies that you could deploy to be more conscious about your temperament today. Speed is often overrated. Note that there is no refrigeration: this is “fully cooked bacon” that comes in a box and takes 15-20 seconds to heat in the microwave before it is ready to eat. 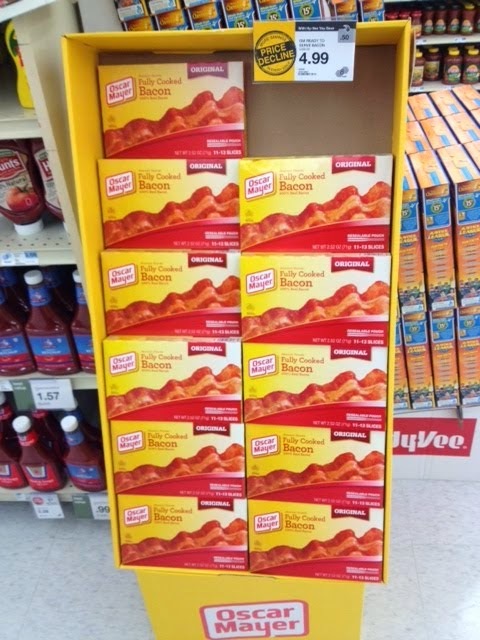 Regular bacon only takes a few minutes, but apparently that is too long for some to wait. Should your organization participate in the quest for speed or can you make yourself so valuable that you don’t need to be on the “instant” bandwagon? You may want to read more tomorrow about why patience matters before you rush out and grab a box of bacon or decide to create the equivalent for your group!